Samanya Rugnalay Ahmednagar (District Hospital Ahmednagar), Ahmednagar Published Job Notification for 01 Blood Transit officer Posts. Candidates who wish to apply must look at Samanya Rugnalay Ahmednagar Blood Transit officer Recruitment 2018. Eligible candidates can join Walk – In Interview on 14th August 2018. 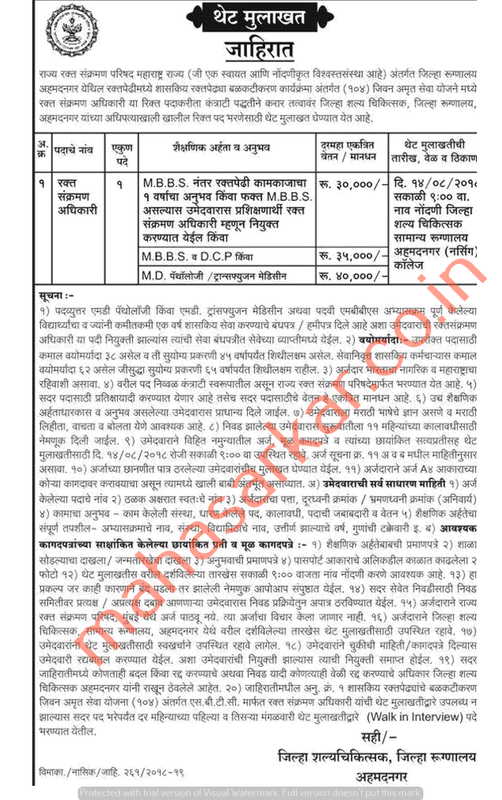 District Hospital Ahmednagar published Job Advertisement telling to apply Samanya Rugnalay Ahmednagar Recruitment 2018. This new advertisement is about the vacancies of Blood Transit officer. Totally there are 01 Vacancies. Candidates are advised to read official notification carefully before applying. Interested & Eligible candidates may attend for walk in interview along with all the documents addressed at DIstrict Surgeon. Samanaya Rignalay, Ahmednagar (nursing) College. Starting Date, Last Date to Apply Offline at District Hospital Ahmednagar which candidates should be remembers as follows. Walk – In Interview on: 14th August 2018.